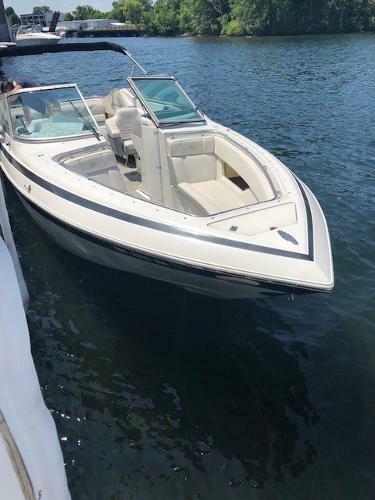 VOLVO 7.4/310 HP* VOLVO DRIVE *498 HOURS (at time of listing)*Swim Ladder* Carpeting* Ski Tow* Bimini Top* Refreshment Center w/ Running Water* * Ice Chest* Dual Batteries w/ Switch* Electric Controlled Swim Platform* Docking Lights* Fender Locker* Drink Holders Surrounding Every Seat* Anchor Locker with Rubberized Liner * Concealed Head* Trailer Not Included The Cobalt 272 has a combination of spaciousness, versatile seating, and standard amenities that make onboard entertaining a matter of course. With a concealed head, a refreshment center with running water, an electrically controlled swim platform, and music piped fore and aft, the 272 is a carefully engineered base of entertainment operations. Underlying all the fun is a 100-percent hand-laid hull. Hand-laid fiberglass has long been the standard of excellence in lamination that lasts, the key to structural strength and durability. It's called Hydrolam, this exclusive process of alternating heavy mat and heavier roving in seven layers of fully cured strength, a process that stretches over four full days of hull construction. Total Reaction Chemistry is here too, increasing the quality of the lamination in every aspect. The results are in the 272's long-term performance and value: elimination of stress cracks, far stronger lamination beginning to end, and visibly increased resistance to blisters. The 272 brings along typical Cobalt practicality. 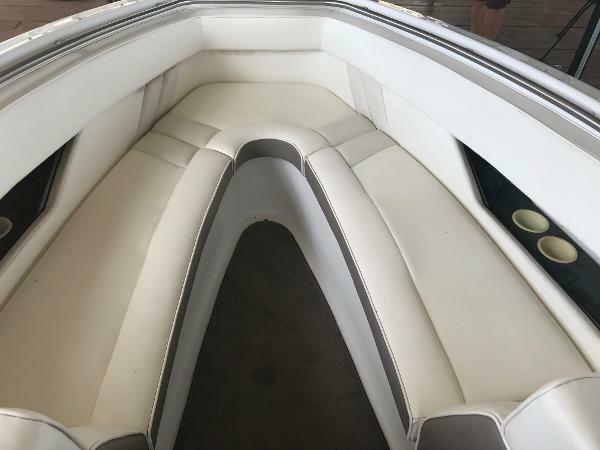 There's a big anchor locker with rubberized liner and gas-assisted door, a one-piece molded bow rail, carpeted storage bins under bow seats, fender lockers, and acrylic walk-through bow doors. The 272's bow is outfitted with: stereo headsets with separate volume controls, courtesy lights throughout, and drink holders surrounding every seat. An optional seat-insert transforms the bow into a sundeck for improvisational fun. In the cockpit, just astern of the flip-lip captain's chair (a five-second transition to a safe and comfortable view above the windshield), the refreshment center incorporates a round stainless steel sink, a bar faucet, and compact circular storage to produce food and drink in a very tight space. The ice chest is portable. It's 56 quarts of portability, in fact, ready to be packed with provisions at home, toted onto the boat and then locked into place behind the wetbar. The 272's head is located portside between the bow and the cockpit, and is totally concealed when not in use. The door (otherwise known as the footrest-and-glovebox assembly) swings open and the head waits below. Total privacy is assured even as an overhead light turns on and, automatically, a fan begins to draw fresh air to the compartment. The electrically controlled swim platform on the Cobalt 272 draws attention from knowledgeable boaters. Made of gelcoat fiberglass with a skid-resistant surface, the platform hides away until it's needed. Then, with the flip of a switch, it lowers to water level, reveals its fold-down ladder and extends a broad, sure-footed, walk-around surface. A courtesy light clicks on for night swims. A second switch, operational by a dog-paddling swimmer, controls the platform from the water. 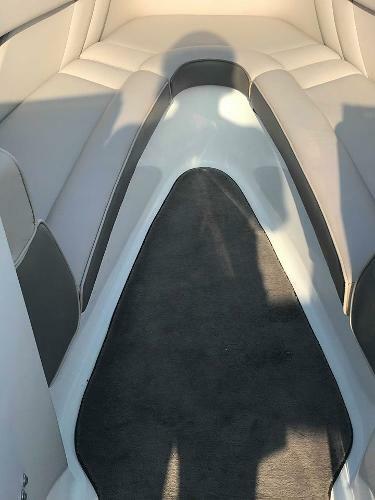 With some engine - outdrive combinations achieving more than 400 horsepower, the 272 still finds room for storage astern: behind the backrest on the aft bench (ideal for stashing life jackets, fenders, running gear, water toys, etc. ), and a surprising amount of free space in the engine compartment itself. The Cobalt 272 carries with it all the guarantees of Cobalt engineering. Here's a 10-year warranty on deck and hull structure (floors, stringers, motor mounts, transom, and all joints in the deck and hull); a five-year warranty on engine, stern drive, intermediate housing, gauges, steering, power trim and tilt, controls, and the electrical and fuel-delivery systems; and two years of protection on the gelcoat finish and upholstery. 2010 Cobalt 272 w/146 freshwater hours. Single owner, stored under cover on lift when not in dry storage. Interior and exterior in excellent condition. Includes bimini, stereo, head, dual batteries with perko switch and swim ladder. Triple axle trailer included. 375hp 8.1 Volvo Gi big block with volvo dp-s outdrive. Engine hour histogram shows 62hrs are just idling. Snap-in carpet is included and hasn't been used in a few years so is still in good condition. No major damage to hull, and gelcoat is still nice and glossy. Props are in excellent condition. No major tears in any of the seats and the vinyl is still soft. Everything works except the transom stereo remote due to replacing the head unit a while back. Trailer tires and batteries are newish. Oil change is fresh and raw water pump impeller has zero hours on it. Boat is ready for the summer. Clean, clear title in hand. Very motivated to sell and open to offers! Please contact Brandon @ five 1 two eight zero 8 8 four 2 eight if you have any questions. Cheers!+$68k NADA, Buy it now $59500 or best offer. Must Sell ASAP!!! 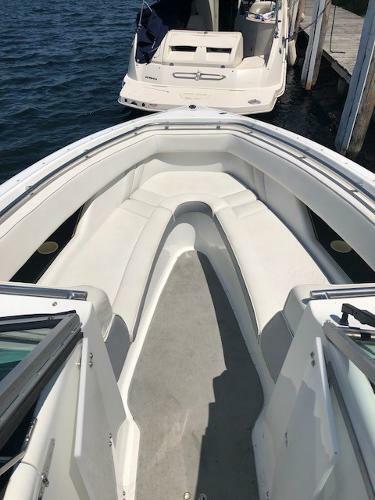 MERC 7.4/300 HP* BRAVO III Drive*237 HOURS (at time of listing)* Extended Swim Platform* Swim Ladder* GPS Map 180* Electric Hatch* Bow & Cockpit Cover* Trim Tabs* Bimini Top* Enclosure* Dual Batteries* Halon* Pump Out Head* Depth Finder* Fm/Cassette Stereo* Docking Lights* Trailer Not Included The Cobalt 272 has a combination of spaciousness, versatile seating, and standard amenities that make onboard entertaining a matter of course. With a concealed head, a refreshment center with running water, an electrically controlled swim platform, and music piped fore and aft, the 272 is a carefully engineered base of entertainment operations. Underlying all the fun is a 100-percent hand-laid hull. Hand-laid fiberglass has long been the standard of excellence in lamination that lasts, the key to structural strength and durability. It's called Hydrolam, this exclusive process of alternating heavy mat and heavier roving in seven layers of fully cured strength, a process that stretches over four full days of hull construction. Total Reaction Chemistry is here too, increasing the quality of the lamination in every aspect. The results are in the 272's long-term performance and value: elimination of stress cracks, far stronger lamination beginning to end, and visibly increased resistance to blisters. The 272 brings along typical Cobalt practicality. 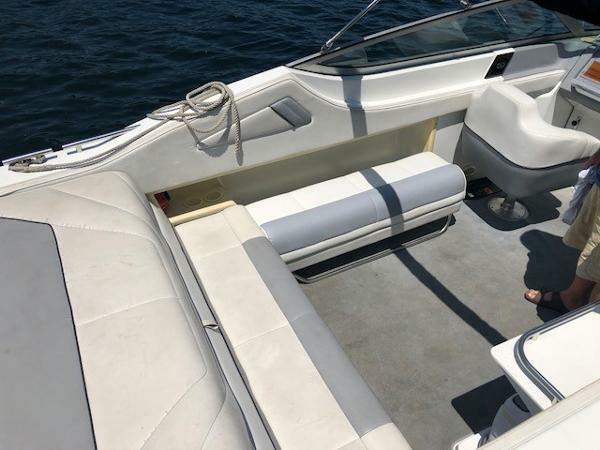 There's a big anchor locker with rubberized liner and gas-assisted door, a one-piece molded bow rail, carpeted storage bins under bow seats, fender lockers, and acrylic walk-through bow doors. The 272's bow is outfitted with: stereo headsets with separate volume controls, courtesy lights throughout, and drink holders surrounding every seat. An optional seat-insert transforms the bow into a sundeck for improvisational fun. In the cockpit, just astern of the flip-lip captain's chair (a five-second transition to a safe and comfortable view above the windshield), the refreshment center incorporates a round stainless steel sink, a bar faucet, and compact circular storage to produce food and drink in a very tight space. The ice chest is portable. It's 56 quarts of portability, in fact, ready to be packed with provisions at home, toted onto the boat and then locked into place behind the wetbar. The 272's head is located portside between the bow and the cockpit, and is totally concealed when not in use. The door (otherwise known as the footrest-and-glovebox assembly) swings open and the head waits below. Total privacy is assured even as an overhead light turns on and, automatically, a fan begins to draw fresh air to the compartment. The electrically controlled swim platform on the Cobalt 272 draws attention from knowledgeable boaters. Made of gelcoat fiberglass with a skid-resistant surface, the platform hides away until it's needed. Then, with the flip of a switch, it lowers to water level, reveals its fold-down ladder and extends a broad, sure-footed, walk-around surface. A courtesy light clicks on for night swims. A second switch, operational by a dog-paddling swimmer, controls the platform from the water. With some engine - outdrive combinations achieving more than 400 horsepower, the 272 still finds room for storage astern: behind the backrest on the aft bench (ideal for stashing life jackets, fenders, running gear, water toys, etc. ), and a surprising amount of free space in the engine compartment itself. The Cobalt 272 carries with it all the guarantees of Cobalt engineering. Here's a 10-year warranty on deck and hull structure (floors, stringers, motor mounts, transom, and all joints in the deck and hull); a five-year warranty on engine, stern drive, intermediate housing, gauges, steering, power trim and tilt, controls, and the electrical and fuel-delivery systems; and two years of protection on the gelcoat finish and upholstery. 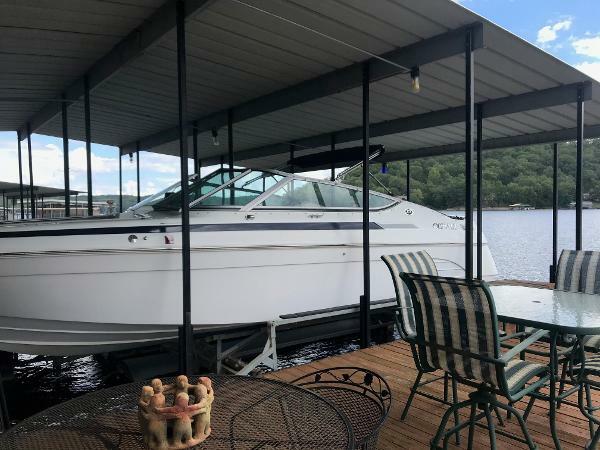 This Is a well maintained 1998 Cobalt 272BR, in fantastic condition! 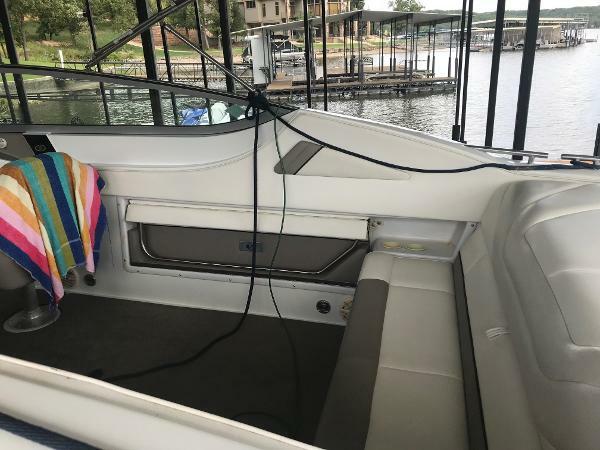 The boat has LOTS of space for you and your family to enjoy the lake. With a Volvo 7.4 GI 310 HP engine, this boat has plenty of power to take on any lake conditions. 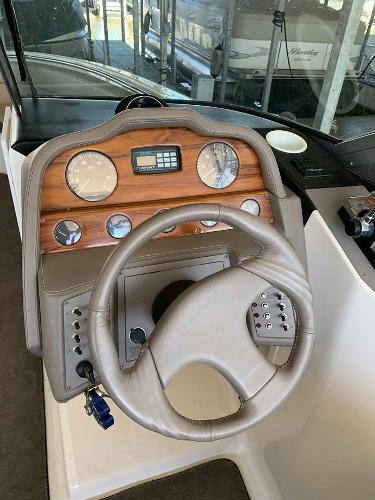 Features include: Trim Tabs and brand-new Batteries, Depth Finder, Bow Filler Cushion, Block Off Door, new Bluetooth Stereo and a Freshwater System for the Head and Sink. The canvas is in great condition! 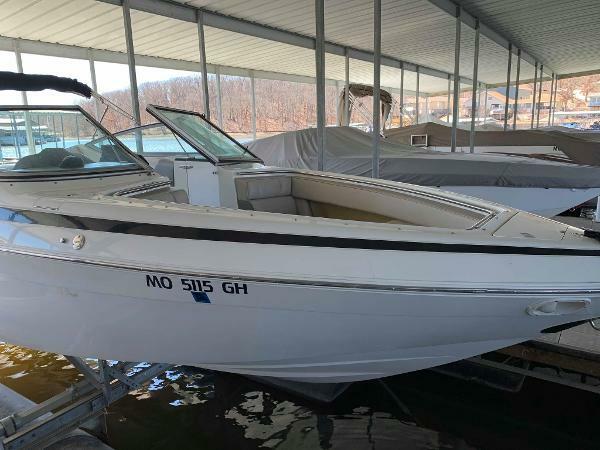 This boat is priced to sell and is sure to be gone soon. This boat can be seen at our Laconia location.